Silvery polished chrome is still the most popular finish for bathroom faucets and other fixtures, but it is far from the only option today. Specialty bathroom stores offer an overwhelming array of colors, metals and styles. While there are important differences between these metallic finishes, what’s inside also counts. Here is a guide to choosing bathroom fixtures, with comparisons of faucet bodies, finishes and valves. You can find other fixtures to match your faucets once you find a good deal on a high-quality faucet with the look and feel you desire. Many metal and plastic fixtures may be coated with nearly any finish, so ask about the material inside the faucet body. Also lift the fixture and feel the weight. A quality faucet should have some heft. Here are the best and worst options for faucet bodies. Brass: All-brass faucet bodies will last for many years, and are unlikely to leak or corrode. It’s worth paying a little more for forged brass faucets. Typically smoother and denser, they are less likely to leak than lighter cast brass models. 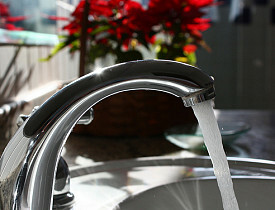 Most brass faucets and other metal fixtures contain lead, which can leach into the water, particularly the first water flowing out of the tap after sitting in the faucet overnight. New federal regulations in 1997 require manufacturers to reduce lead levels in their faucets, but even “lead-free” versions can leach tiny amounts into the water. Steel: Cheap steel faucets are likely to rust. Stainless steel faucets are good, but typically won’t last any longer than a good brass model, so the extra cost may not be worthwhile. Zinc: Faucets made of zinc and zinc alloys are among the cheapest but least durable of the metal faucets. Plastic: Plastic is the most inexpensive, but also the least durable. However, plastic faucets are the only models with no lead. Chrome: The most popular finish is polished chrome, which is really bonded to a layer of nickel on the fixture’s base metal. Chrome is tough and scratch-resistant, but keep in mind that it can only protect the surface of a faucet. Inferior faucet bodies can still corrode or crack from the inside. Nickel: While polished nickel finishes are significantly more expensive, they have a rich golden tone that chrome can’t match. Brushed nickel is warmer and softer for a spa-like bathroom atmosphere. Also, these upscale matt finishes have a secret advantage: they hide water spots and fingerprints better than shiny finishes, so they don’t need to be cleaned as vigorously. Hammered nickel is a newer specialty option on the market, with a rough texture and classic style. Bronze: If you want to customize a bathroom, bronze may be the way to go. Kohler and other major manufacturers produce faucets in brushed, oil-rubbed and polished bronze tones. They all have the deep color of bronze, but varied looks and textures. Look for bronze finishes with physical vapor deposition (PVD) or clear epoxy coatings. PVD coatings are charged metal atoms that bond chemically to the surface of the metal and help resist corrosion and scratches. Brass: Golden-toned brass fixtures offer a high-end look at a reasonable price. They provide sharp contrast, and a unique break from the chrome standard. However, they are high-maintenance and typically require regular polishing to prevent tarnish. Pewter: The subdued gunmetal gray tones in pewter finishes offer another unique alternative to the typical bathroom faucet. You also should consider the small moving parts you can’t see from the outside of the fixture. The best valves are ceramic or bronze. Steer away from steel or plastic. Choose a finish that matches your lifestyle as well as your tastes, but go beyond the shiny surface when considering your options for bathroom fixtures. Look for solid brass bodies and bronze or ceramic valves. For expert faucet installation, call a professional plumber. Help Wanted: Plumber Repair Service ... Please!